The Adaptil Collar is easy to use. The dog’s body temperature warms the collar and encourages the diffusion of pheromones into the local environment. medium/large dogs (fits neck up to 62.5cm). 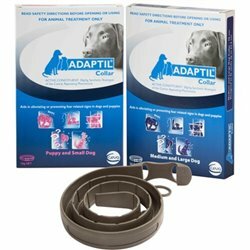 Each collar lasts 4 weeks and can be replaced as required. How to fit an Adaptil Collar? Check the collar at regular intervals. It must remain snug against the dog's neck.